Scott explains the subtle nuances of his technique as he attempts to create the perfect mixtape for his girlfriend Beth. Struggling with Lupus, Nick dramatically changed his diet to help keep his disease in remission. 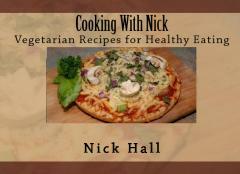 In Cooking with Nick he shares his story and brings you some of his favorite vegetarian recipes; including lasagna, sweet potatoes, pasta dishes, desserts and more! These delicious and easy to make dishes are what he eats to help keep his Lupus in check and live a healthy life. Pulp magazine showcase coming soon!